‘Tis the season for getting buried! 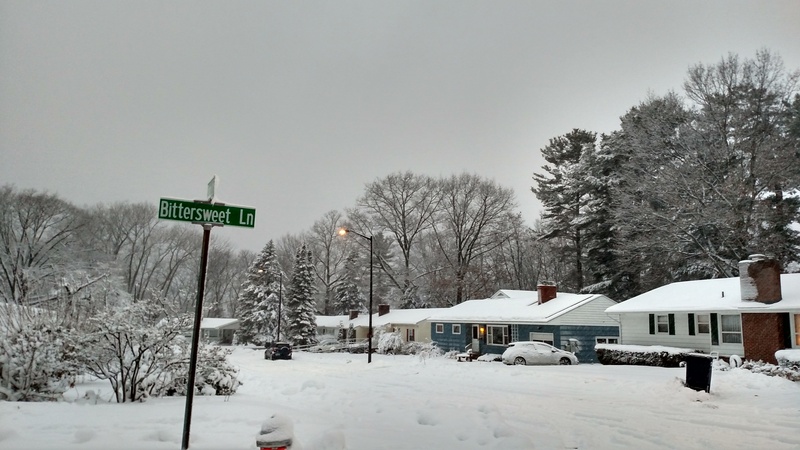 Vermont just got its first real winter storm. For those of us with solar roofs, this means not only shoveling out the driveway, the walkway, the vehicles, etc, but might also include clearing off the panels on the roof so they can do their magic. 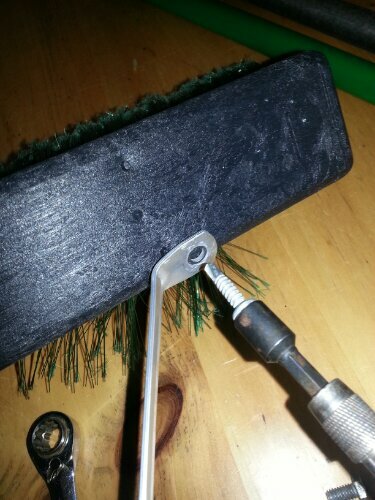 2) Modify the part of the roof rack handle that bolts to the rake head. 3) Modify it some more. 6) When you finally get the slightly-too-large post into the socket, put a screw through it to make sure it doesn’t come loose. 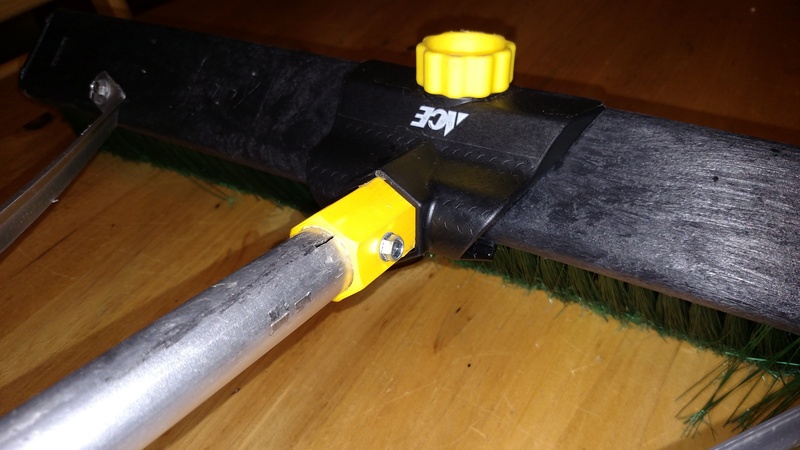 7) Now use some self-tapping screws to attach the stabilizing arms. Now the real work starts.. Pulling and pushing heavy wet snow 10 to 20 feet above your head. I actually use both attachments depending on type of snow. A light dusting is best cleared with the broom head. But the kind of sno-cement we had on there today required a pass with the rake, then cleaning it up with the broom. Was all that effort worth it in the end? Probably not. We only generated 4 kWH today and used over 28. But as I’ve said before, I can’t make my own energy but I can harvest it! And that brief moment mid-day when the power meter runs in reverse, that’s always worth it in my book! I use a “Sno-Brum” for my solar array. It is a rectangle of plastic reinforced closed cell foam. It is made for cars and comes with a short handle. Easy on the anti-reflective coating but stiff enough to plow through wet snow. I got a piece of 2 1/2″ x 1/8″ steel , drilled a few holes in it, and bolted it to the plastic core for extra strength. 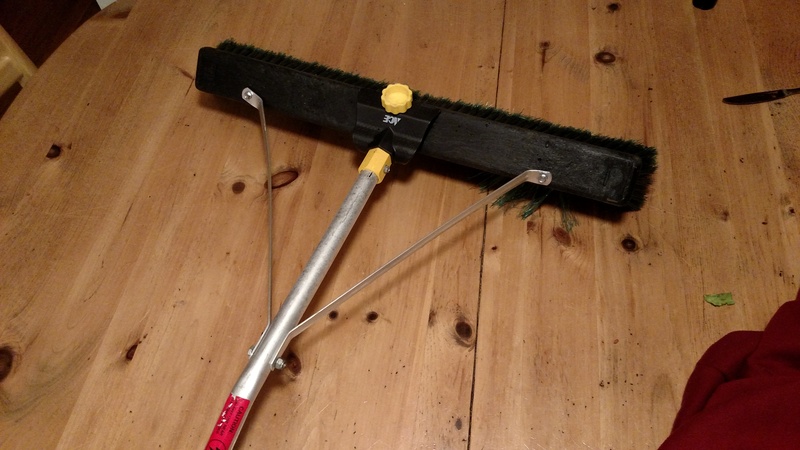 The Sno-Brum screws onto a standard painter’s extendo-pole. I’ve got one that goes out to about 16′. I remember seeing an extra large Sno-Brum made for trucks and buses.